NGC 1499 is located about 1500 light years away from us in the same Orion arm of the Milky Way that contains our Solar System. The nebula itself is about 100 light years long and covers approximately 4 degrees by 1 degree in the sky (about 8 Full Moons by 2 Full Moons). 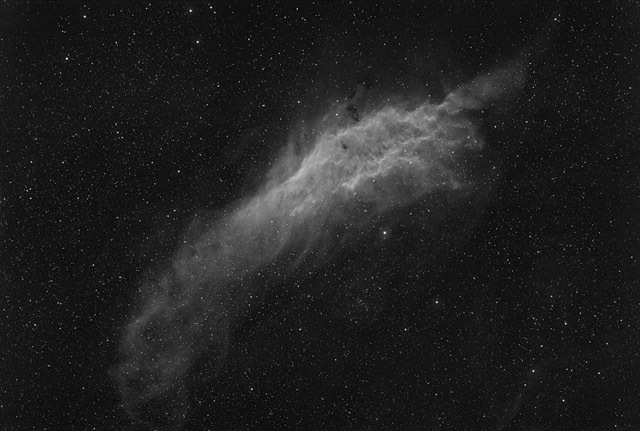 This image has a field of view a little over 6 degrees by 4 degrees and shows some of the faintest outer parts of the nebula. Software Used Images Plus 5.75 for camera control, calibration, stacking, digital development, feature mask, smoothing and noise reduction, line suppression, horizontal banding suppression, and multiresolution sharpening. Photoshop CS5 used for levels and curves, high pass filter, screen mask invert, and unsharp mask. Gradient Xterminator for gradient removal. Focus Magic for focus restoration. Registar for stack alignment and registration. Notes This is the second object I've imaged with my new Monochrome 450D. I'm very happy with how much of the faintest parts of the nebula I was able to capture as well as the nice contrast between NGC 1499 and the embedded dark nebulae.